My love for photography began in the early 1950's, when my parents gave me my first camera, a Kodak Brownie Hawkeye. Several photos made with that camera are in the “Family” section of this site. Later, during my career in the Navy, I travelled with several 35mm single-lens-reflex cameras. Many of my navy-travel photos are displayed in the “Travel” section. 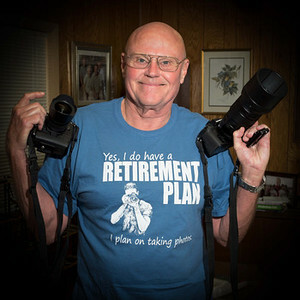 Several years ago, after many years without a serious camera, I renewed my interest in photography when I obtained my first digital-single-lens-reflex camera. As I travel around Florida and the other southeastern states, I'll post many new photos here. My main interests are nature, travel, architecture, and landscape photography. I'm a member of North American Nature Photography Association and Beaches Photography Club. I hope you will spend some time here and check out my work. I am always interested in your comments and advice. Please be sure to post your remarks in the comments sections or shoot me an email. Friends, family members, and others who are interested will find a "Family" section tucked away in a corner of the site. That section contains many recent family photos and memories from the past. I love to travel around the southeastern United States. Please let me know if you have any special requests. I consider myself a "serious amateur photographer" now, although I may be interested in selling my work. Please be sure to contact me if you are interested in purchasing any of my photos or discussing contract work.